WITH the finals race getting tighter as each week passes, the mid-table bottleneck looks certain to be shaken up this week with sides itching to get back into form and build a run heading into the back end of the season. Southern Districts will hope to put a sizeable dent in Tiwi Bombers’ top four hopes with another emphatic win to open the round away from home. The Bombers were previously on a three-game win streak after opening their account in Round 6, but were brought to a halt at the hands of a fearsome Nightcliff side. The Crocs meanwhile look to have regained the early-season form that saw them break multiple games clear at the top, with four points and a handsome percentage acting as their buffer as things stand. An 111-point thumping of Palmerston last time out puts them in good stead against an in-form team here, as the Bombers remain a dangerous opponent. With arguably its best side forming in the last two weeks, Southern Districts will look to the former-AFL class of Richard Tambling (five goals in Round 9) and Jared Brennan to star once again alongside regulars Michael Mummery and Bradley Vallance forward of centre. There are plenty of moving parts in the Crocs lineup, with the likes of Jess Koopman coming off a bag of six goals and Seb Guilhaus showing consistent form alongside Dean Staunton. As has been the story all year, the firepower of the Crocs needs to be matched, and Bomber forwards Dion Munkara, Ross Tungatalum and Austin Wonaeamirri will have to be the ones to stand up if the Bombers are to steer away from falling short as they did against Nightcliff. Jason and Harley Puruntatameri will also have to have big games further up the field to help Tiwi’s cause in an important match-up that has implications on the Bombers’ finals spot. Wanderers will be hoping to join St Marys in the race for fifth spot when they open TIO Stadium’s Saturday evening double-header. The wasteful Saints missed a trick last time out as they fell just short of the stumbling Darwin Buffaloes, but will have a good amount confidence coming up against the bottom side given they are not entirely out of form. Meanwhile, the Eagles will be disappointed with their Round 9 showing given they finally broke through for their second win of the season in the previous week, and they have the chance to scrape off the bottom of the ladder with a win here. With Davin Ferreira in irresistible form after five goals last week, anything is possible for the Muk Muks. Add the recent form of Thomas Motlop and John Tipiloura to the mix and Wanderers have the potential to put up a fight. The Saints have proven to be no easy-beats in recent weeks though, even picking up two wins in their last five games to hold firm in the NTFL ladder’s middle ground. Mathias Liddy will need to be good in front of goal again this week, while the likes of Ben Rioli and Nathaniel Paredes in midfield should provide great consistency alongside the flair of young gun Maurice Rioli jnr. With wavering scoring form on both parts, this clash could well either provide a shootout or a low-scoring affair – but the side that takes its chances will undoubtedly come out on top in what looks like a close one. A return to form is in the midst for both Darwin Buffaloes and Palmerston Magpies as they do battle to round out Saturday’s action. The Buffaloes breathed a collective sigh of relief as they narrowly got over the line against St Marys last week on account of accurate goalkicking, returning to the win column after two straight defeats. Meanwhile, Palmerston have lost three consecutive games and despite putting up a competitive effort against in-form side Nightcliff, were beaten comprehensively at the hands of a rejuvenated Southern Districts last time out. With both outfits keen to break clear of deadlocks with rival sides on the ladder, expect the kitchen sink to be thrown in an attempt to get over the line. With young star Malcolm Rosas spending time at Gold Coast and Brisbane, Adam Sambono will need to step up and provide that X-factor, with the likes of Matthew Campbell and Javadd Anderson in good form, while Joe Anderson looks to slot back into the side. For Palmerston, the same core group of players have provided unwavering consistency throughout the year, with Matthew Dennis holding his ruck spot down and Rodney Baird and Samuel Talbot solid year-round. Kyle Emery will hope to step up after drawing a blank last week, while Samuel Autio should provide good fold for him as he has done over the last two weeks. It may not be pretty, but a win for either side would serve as a nice confidence booster going into the back half of the season as finals spots become hotly contested. Third-placed Waratah will be looking to close the gap on weekend opponents Nightcliff when they clash at PSC BM Oval to close out the round in what as shaping as a thriller. The Tigers had it tough in Round 9 as they clawed over the line against Tiwi, but hold the most consistent run of form out of all sides having won three consecutive games. Waratah have done well to hang with the top four sides, benefitting from a Darwin slump to move to third and close within striking distance of the established top two. With plenty of experience in the form of Cam Ilett and ex-AFL listed forward John Butcher heading the side in recent weeks, while Liam Holt-Fitz has provided good spark alongside Shaun Wilson. Spearhead Trent Melville will have to step up this week after going goalless last time out, with Waratah forward Cameron Barrett coming off a round-high six goals. The addition of Kim Kantilla has been handy, and the impact of Raven Jolliffe will be key this week, too. American big-man Alex Aurrichio has also come into form of late, and should provide some sturdiness in the ruck or defence against a dangerous Tigers line-up. Despite second being poised against third, Nightcliff will be confident coming into this one, and it will be a key game in keeping touch with Southern Districts. Waratah will also want to avoid dropping points and falling behind Darwin once again, so expect some desperate footy. 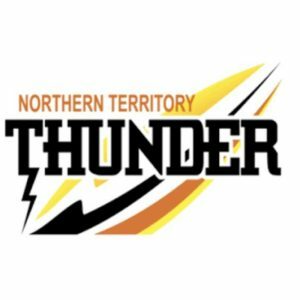 EACH of the bottom four sides suffered defeats in a round which proved to be a tipper’s paradise in Northern Territory Football League (NTFL) Men’s Premier League action, leaving the ladder relatively unchanged. Nightcliff: C. Ilett 3, L. Holt-Fitz 2, J. Butcher 2, M. Hagan 2, H. Drogemuller, S. Wilson, F. James. Tiwi: H. Puruntatameri 2, D. Munkara 2, L. Wale-Buxton 2, R. Tungatalum 2, C. Burgess, M. King. A strong opening term proved all the difference for Nightcliff in its narrow win over the in-form Tiwi Bombers in the game of the round. The Tigers kept their opponents goalless in the first quarter to help open a 21-point lead which they managed to hold for most of the match. It was on the final straight where Tiwi made its biggest surge, falling seven points short to the second-placed side despite scoring 4.5 to Nightcliff’s 2.2. The Tigers had contributors across the board, with legendary veteran Cam Ilett, ex-Port forward John Butcher, Liam Holt-Fitz and Michael Hagan each booting two goals, with the latter two named among the best. Jonathon Miles was adjudged the most valuable player afield, with Joel Budarick returning to form and Gavin Greenoff also thereabouts. 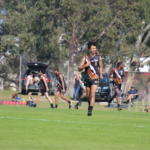 For the Bombers, Jason Puruntatameri was reliable as ever, while newcomer Liam Wale-Buxton also proved his star debut performance was no fluke with two goals. Ross Tungatalum and Dion Munkara were others to claim two majors and round out the best players in a valiant team effort. The result bears little consequence on the ladder, with both sides staying put in second and fifth respectively, with Tiwi still level with St Marys and Palmerston and two wins away from cracking the top four. Wanderers: D. Ferreira 5, J. Tipiloura 3, M. Totham, J. Cubillo, S. Bates. Waratah: C. Barrett 6, R. Jolliffe 3, K. Kantilla 3, S. Weddell 2, B. Minkulk, J. McKenzie. Waratah claimed an important win in its bid to consolidate a finals spot with a comfortable enough 27-point win over bottom-placed Wanderers. With both sides converting well in front of goal on account of a spearhead goal-off, the match was evenly poised going into the main break with Waratah holding a three-point lead. The Warriors managed to pull away from the deadlock in the second half though, with nine goals to five seeing them over the line. Cameron Barrett was the star of the day, booting six goals in a dominant display for Waratah, beating out Wanderers’ Davin Ferreira’s total of five. Raven Jolliffe and Kim Kantilla snared three each, with Samuel Weddell rounding out the multiple goalkicker with his two. John Tipiloura took the opportunities that Ferreira didn’t manage to snare to claim three majors, with Tyler Brimacombe adjudged the Eagles’ best alongside Thomas Motlop despite not hitting the scoreboard. The win sees the Warriors wedged two games above fifth place in equal-third, but two games below Nightcliff in second. Their strong finals position is a far cry from Wanderers in last, but the Muk Muks are only a win away from re-joining the race for the last finals spot. Darwin: M. Campbell 3, A. Sambono 3, J. Anderson 2, P. Boles, J. Stokes, A. Punch. St Marys: T. Frawley 3, M. Liddy 2, N. Paredes, M. Rioli Jnr, S. Rioli. Darwin kept pace with fellow top four contenders Waratah with a hard-fought 15-point win over St Marys to round out Saturday’s TIO Stadium triple-header. The Buffaloes’ 11-point quarter time lead was a constant throughout the game, as the Saints couldn’t quite manage to break through and bridge the gap between their more efficient opponents. St Marys’ inefficient tally of 8.14 proved the difference in the end, with its four more scoring shots wasted in a tight finish. Maurice Rioli jnr earned a rising star nomination for his efforts – booting a goal and finishing in the best half-dozen players for the second time in three games for the Saints. With Darwin’s very own young star Malcolm Rosas currently making himself comfortable at the Gold Coast Suns, the experienced head of Matthew Campbell (three goals) and Javaad Anderson (two goals) helped to maintain their form, with livewire Adam Sambono also booting three, while Ryan O’Sullivan was named best-on for the second game running with help from the consistent Kevin Maroney. Tom Frawley found form for St Marys with three goals, but Nathaniel Paredes was his side’s best as he also managed to claim a goal. Nicholas Yarran is another who has shown promising form of late, and was also named in the best. Despite the win, Darwin falls below Waratah to fourth place on percentage, while St Marys remain in the thick of a mid-table bottleneck as it fights for fifth place with Tiwi and Palmerston. Wins will be paramount to the Saints’ cause from here on out, with Tiwi in hot form and a two-game gap opening between fourth and fifth. Southern Districts: J. Koopman 6, R. Tambling 5, C. Gallio 3, M. Mummery 2, B. Vallance 2, W. Farrer, B. Rusca, C. McAdam, D. Staunton, I. Wyatt, J. Farrer. Palmerston: S. Autio 2, J. Marshall, J. Lampton, B. Church. Southern Districts looks to be back to its destructive best after a dominant 111-point win over second-bottom Palmerston in the round’s final fixture. The Crocs were as shrewd as ever, with arguably their best 22 for the year returning a stellar performance. Starting as they wished to go on, the Crocs booted 15 opening half majors to Palmerston’s four, not giving the Magpies a sniff throughout the entire contest. While Jess Koopman was the round’s equal-leading goal scorer with six, former number four draft pick Richard Tambling was named best afield with his haul of five, returning multiple goals for the first time this season alongside Clinton Gallio, who booted three. With usual goal threats Michael Mummery and Bradley Vallance also thereabouts with two goals each, and Jared Brennan slotting in seamlessly up the field, it was a complete performance from the reigning premiers. Samuel Talbot was again the best for Palmerston with Rodney Baird not far behind, while Samuel Autio was the only multiple goalkicker with two. Last year’s bottom side Palmerston now flirts with the possibility of falling back down the cellar door with Wanderers holding a greater percentage despite being a win behind. Southern Districts on the other hand, maintains its four-point lead atop the table, and looks to have regained its early season form.